Bolivia Grabs World Media Attention with Salt Hotel Development Challenges: Tourism is a great way to attract foreign currency to a country and build local economies, especially in remote or isolated places. But the catch is finding a way to get people to go the distance and come and visit and spend their money. Mapping Beirut Brings City to Light Development Challenges: As cities in the global South grow ever larger, their often-chaotic evolution can create sprawling urban mazes that would confuse even the brightest brains. Extra story: 2011 Trends for the South Development Challenges: The world has been through a dramatic and fascinating period since the global economic crisis erupted in 2008. While the wealthy, developed nations of the North have been pitched into one crisis after another, the countries of the global South (many of whom are well accustomed to crises) have been part of a powerful new economic phenomenon: the rapid growth of South-South trade, investment and exchange. Its effects include stronger ties between Asia and South America and between China and Africa. 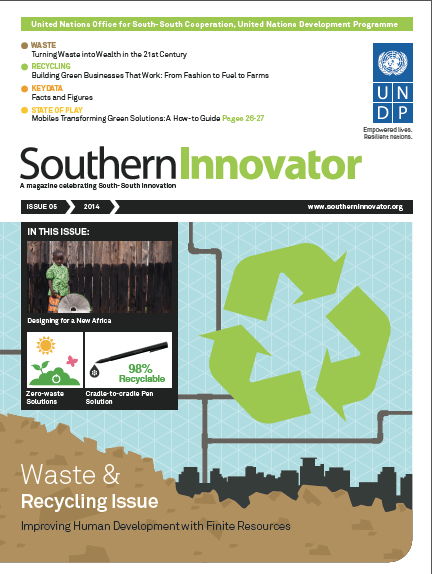 The third issue of Southern Innovator magazine has launched. Order advance copies now for distribution. Email: southerninnovator@yahoo.co.uk. 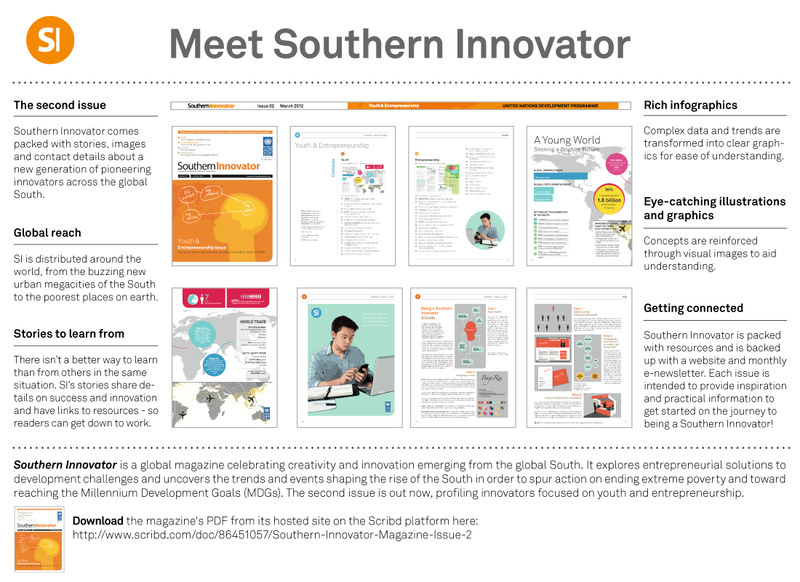 The second issue of Southern Innovator magazine has launched: Read and download the magazine here: Southern Innovator Issue 2. New Cities Offering Solutions for Growing Urban Populations Development Challenges: Across the global South, new cities are being dreamed up by architects, city planners and governments, or are already under construction. Two new urban areas being built offer lessons for others in the global South. They both deploy intelligent solutions to the combined demands of urbanization, growing populations and rising expectations. Biogas Digester-in-a-Bag Brings Portability Development Challenges: Securing energy sources that are cheap (or free) and renewable can significantly reduce the cost of living for the world’s poor. The cost of fuel for essentials such as cooking and lighting can quickly eat up household incomes. Global South Urbanization Does Not Have to Harm Biodiversity Development Challenges: How to balance fragile ecosystems with rapid urbanization will be the challenge for planners and governments across the global South in the coming years. The urbanization trend is clear: the world’s total urban area is expected to triple between 2000 and 2030, with urban populations set to double to around 4.9 billion in the same period (UNEP). This urban expansion will draw heavily on water and other natural resources and will consume prime agricultural land. Diaspora Bonds to Help Build up Infrastructure Development Challenges: Many people are aware of the significant role played in global development by remittance payments from migrant workers working in the wealthy North to the global South. But they may not be aware of the significant sums migrant workers have saved in bank accounts in these wealthy countries. Across the global South, efforts are underway to lure these sums back to home countries to boost development efforts. Global South Eco-cities Show How the Future Can Be Development Challenges: The world is currently undergoing a high-stress transition on a scale not seen since the great industrial revolution that swept Europe in the 19th and 20th centuries. Today’s urban and industrial transition involves many more people and is taking place on a greater proportion of the planet. With rapid urbanization comes a demand for middle class lifestyles, with their high-energy usage and high consumption of raw materials. New Swimwear for Plus-size Women in Brazil Development Challenges: Brazil is well known for its stylish swimwear, with styles usually targeted at young women and those with more conventional, media-friendly body shapes. But now a company is making visiting the beach more comfortable and empowering for plus-size women. Havana’s Restaurant Boom Augers in New Age of Entrepreneurs Development Challenges: Cuba, the Caribbean island nation known for its 1959 revolution and its tourism industry, is undergoing a shift in its economic strategy. The country has had heavy state control of its industries and business activities since the country adopted the official policy of state socialism and joined the Communist economic sphere headed by the Soviet Union. Global South’s Rising Megacities Challenge Idea of Urban Living Development Challenges: The world crossed the threshold from being a majority rural world to a majority urban one at the end of the first decade of the 21st century. The reason for this is the fast-growing urban areas of the global South. And this is having a profound affect on how the world’s people live. Frugal Innovation Trend Meets Global South’s Innovation Culture Development Challenges: There is a trend occurring across the global South that some are calling the next great wave of innovation. It has different names but many are dubbing it ‘frugal innovation’. Frugal innovation is basically innovation done with limited resources and investment. In short, innovation on the cheap but packing a big punch. Global South’s Rising Economies Gain Investor Spotlight Development Challenges: A new book is arguing that the world’s attention should switch away from BRICS countries – Brazil, Russia, India, China and South Africa – and take another look at nations and regions elsewhere across the global South. It argues many are lodestones of future growth and prosperity in the making and will see dramatic changes over the next decade. Hip-driven Pump Brings Water to Parched Fields Development Challenges: Finding ways to increase agricultural productivity is key to expanding food supplies and making farming pay. With the world’s population continuing to rise and becoming more urban, there is a pressing need to improve both the quantity and quality of food supplies. New Cuban Film Seeks to Revive Sector Development Challenges: Since Cuba’s 1959 revolution, the country’s film sector has largely survived on the largesse of the state. The switch to Communism as the guiding economic model of the country after the revolution led, at first, to generous support to filmmakers. The government ranked cinema ahead of television seeing both cinema and television as the two most important forms of artistic expression in the country. But as state funding has dwindled in recent years, adventurous independent filmmakers have tried to keep the Cuban film tradition going using other sources. India’s Modernizing Food Economy Unleashing New Opportunities Development Challenges: Increasing prosperity in India is reshaping the country’s relationship to its food. A number of trends are coming together that point to significant improvements to India’s long-running problems with food supply and distribution. This matters because India, despite its two-decade economic boom – and increasing middle-class population – is still home to about 25 per cent of the world’s hungry poor, according to the World Food Programme (WFP). Business Leads on Tackling Violence in Mexican City Development Challenges: The damaging affects of crime and violence can ruin a city. They act as a drag on efforts to increase wealth and improve living conditions, and a city that gets a bad reputation, especially in the age of the Internet, will lose investment opportunities. 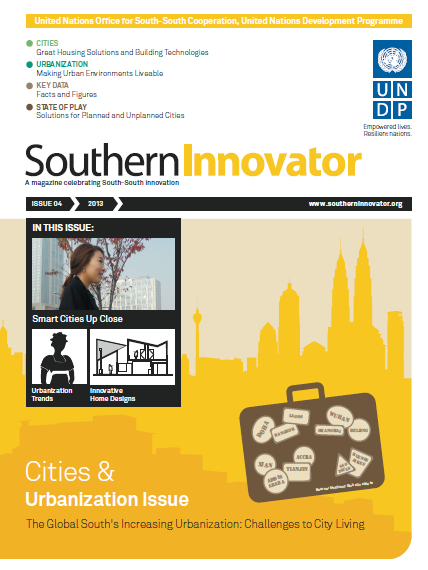 The fourth issue of Southern Innovator has launched online and in print. Order copies now for distribution. Email: southerninnovator@yahoo.co.uk. Development Challenges: Away from the news headlines, a quiet revolution has been taking place in public transportation across the global South. As cities have expanded and grown, they have also been putting in place public transport systems to help people get around and get to work. 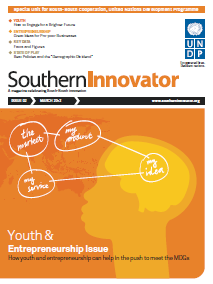 The fifth issue of Southern Innovator has launched online and in print. Order copies now for distribution. Email: southerninnovator@yahoo.co.uk. Issue six will be on science, technology and innovation. This issue will be different from previous issues and will be including supplements and inserts to boost the impact of the magazine. Southern Innovator is seeking sponsors to fund this and also to help us expand the print run (currently 5,000 copies for global distribution). Innovative Solutions Celebrated in Ashden Awards Development Challenges: The world’s population is heading towards 9.6 billion by 2050 (UN). Combined with a growing middle class and rising living standards across the global South, that means ever-greater demand on the world’s finite resources. This raises a crucial question: Where will the energy to power rising living standards come from, and how much damage will be done to the planet’s environment by pollution created generating it (https://www.un.org/en/development/desa/news/population/un-report-world-population-projected-to-reach-9-6-billion-by-2050.html)? Caribbean Island St. Kitts Goes Green for Tourism Development Challenges: Going green may sound like the right thing to do but it can also be associated with being a costly burden and boring. But, as one island nation is proving, being green is a great selling point for attracting tourists and investors – especially in a world where many places are grappling with pollution and resource depletion. Big Data Can Transform the Global South’s Growing Cities Development Challenges: The coming years will see a major new force dominating development: Big Data. The term refers to the vast quantities of digital data being generated as a result of the proliferation of mobile phones, the Internet and social media across the global South – a so-called ‘data deluge’ (UN Global Pulse). It is an historically unprecedented surge in data, much of it coming from some of the poorest places on the planet and being gathered in real time. South-South Trade Helping Countries During Economic Crisis Development Challenges: Weathering the global economic crisis is testing the stability of countries across the global South. But many countries are finding South-South trade and catering to their domestic middle classes can lift incomes and maintain growth rates despite the global turmoil. Brazilian Design for New Urban, Middle-Class World Development Challenges: Countries across the global South are experiencing rapid urbanization as people move to cities for better economic opportunities — and this massive social change is creating new business opportunities. Those who recognize how fundamentally people’s lifestyles are changing will be those who will benefit from this big shift in populations. Cheap Paper Microscope to Boost Fight Against Diseases Development Challenges: To tackle diseases in the developing world, the most important first step is diagnosis. Without effective diagnosis, it is difficult to go to the next steps of either treatment or cure. While much attention is given to the high costs involved in treating and curing ailments, screening for diagnosis is also expensive, especially if it involves lots of people. Anything that can reduce the cost of diagnosis will free up resources to expand the number of people who can be checked, and help eradicate contagious diseases. Reality Television Teaches Business Skills in Sudan Development Challenges: Learning how to thrive in a market economy does not necessarily come naturally. But for young people who have grown up under a different economic system or known nothing but economic chaos, learning business skills can give them the tools to get on in life.